Welcome unique gift giving thinkers! This Flower Meanings Chart is your dream come true when it comes to gifting with flowers.You'll never look at flowers the same again when you learn that every flower has meaning, symbolism, and actually speaks it's own language. Flowers, by their wondrous beauty, call attention to themselves just by existing. YET..when it's you that gives them, their ability to bring pleasure increases ten-fold because they will now be blended with your unique knowledge and gifting style that will absolutely personalize the flower to your gift recipient. It will seem as if the flower exists for them alone. Already know HOW you feel and WHAT you want to SAY? Here's a Chart that lists the feeling or word first, THEN the flower that says it. Although this list is by no means complete, it's important that you also know what these flowers actually look like, especially if you've got an idea in mind for a type of flower and gift for someone in particular. If you're like me, you've seen a lot of these flowers before but for the life of you can't remember what they're called. Refresh your memory with an image. Picture examples of each of these flowers can be accessed if you Google Search them under Images. For accuracy, add the word "flower" following the name, i.e. 'Carnation Flower'. 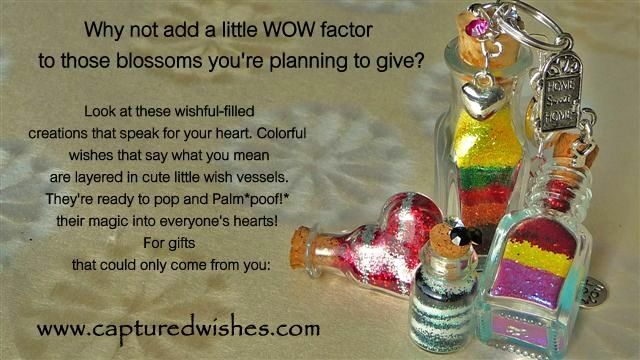 Need more info about a certain flower to inspire gift ideas? Check out Flower Info.org and their listings. This page hopefully provides interesting background on popular/easily recognizable flowers. This Flower Meanings Chart is full of flower symbolism - there may be some meanings that come from different cultures, from the east and west and around the world - even Latin language and the age of the Greeks. Don't forget. Whatever flower gift you put together, send along a card, a note, a letter, a plaque, a personalized inscription on a mirror, a caption, SOMETHING that explains why it is you are giving them what you are giving them. They need to know your feelings through the flowers. Transfer your emotions to them through the flowers. Wait. Not sure this is what you're looking for? Already know how you're feeling? Then put those words into flowers. Flower CHART Guide that shows you which flower can say it for you. The guide is unique in that you can find your feeling or emotion first and THEN see which flower speaks that. Balm, Bee (Monarda or Bergamot) Compassion, Empathy, Your “wiles” are irresistible! Dahlia, Variegated I think of you constantly! Dahlia, Yellow I am happy that you love me! Geranium, Scarlet Folly, Stupidity, Distrust, Your smile bewitches me! Lilac, Mauve Do you still love me? Be creative with your gifting of flowers. Think in flower sentences. Here's an example. On Mother's Day or her birthday, give your Mom an interesting bouquet of Dahlias (gratitude), Sunflowers (adoration) and Light Pink Roses (admiration). If you have a fun relationship with your mother like I do, attach a card that just says "GAA!" Then explain yourself, of course. Daisy 1: What kind of a garden do you come from? Alice: Oh, I don't come from any garden. Daisy 2: Do you suppose she's a wildflower? Myrtle Joy, Love, Mirth (gladness or gaiety accompanied with laughter), Mutual agreement, Married bliss, Perfect flower for a bride to wear in their hair; grooms carried myrtle at the marriage, Greek authorities making announcements held myrtle in their hands, It is not unusual for these flowers to be traded amongst friends to express the wish that the recipient receive all of the joys that life has to offer. Passion Flower Belief, Faith, Pretty, Spirituality, Symbolizes the death of Jesus - the sepals and the petals represent the disciples; the double row stands for the crown of thorns and the stamens stand for the wounds, Piety, Yearning for long lost paradise - "In MY world..."
The *Saffron Crocus - amazingly, it can be grown in your garden quite easily. Looking at it plainly, the plant--it's just a variety of autumn crocus--but from it comes saffron spice, the most expensive spice in the whole world. Tracing saffron history back 400 years, it is interesting to learn that saffron has in fact always been the most expensive spice known to the world, the reason being that it's the 3 stigmas of each plant that constitute the spice - you can imagine the vast number of crocus plants it takes to make even one ounce of spice. The gifting of a crocus may seem like it's not a big deal until you compare it to your recipient with twists such as how valuable they are, how the words "expensive" and "costly" imply that price implies fineness, preciousness, etc. Your special person can be just like Saffron - a wondrous compilation of small beautiful parts that make them the most precious or the finest in the whole world! ... Or something like that. As mentioned earlier, this list is not complete, only for the reason that there are SO SO many flowers in the world - and many of them we have access to through our florists.